The first and subsequent treatment will normally take 40 – 45 minutes. On your first visit the osteopath will need to take an extensive case history, which will require personal and medical details as well as a history of the problem to be addressed. From this information the osteopath begins to formulate a diagnosis and appropriate treatment plan. The osteopath will also need to assess your posture and movement. This will initially be done whilst you are standing and then will continue once you are lying on the treatment table. Once the osteopath has discussed their diagnosis and proposed treatment plan with you, they will begin your first treatment. Some problems may be simple and only require 2-4 treatments to reach conclusion, others may be more complicated and need several short terms treatments followed by a few spread out treatments to monitor progress. 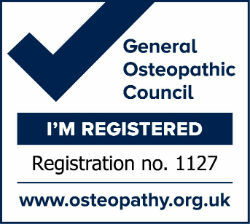 The osteopath may make suggestions linked with posture, lifestyle, diet or exercise to help you. Treatment is normally fairly gentle, but may entail some stronger movements – the osteopath will always tell you what he/she is doing as the treatment progresses. Quite often, though, people will feel relaxed, more mobile and in less pain. If ever you have any worries we would always encourage you to phone the Practice and one of us will be able to advise you.